Highlight of the month for me was the wonderful annual Evidence Live conference in Oxford. I also got to give the opening keynote. 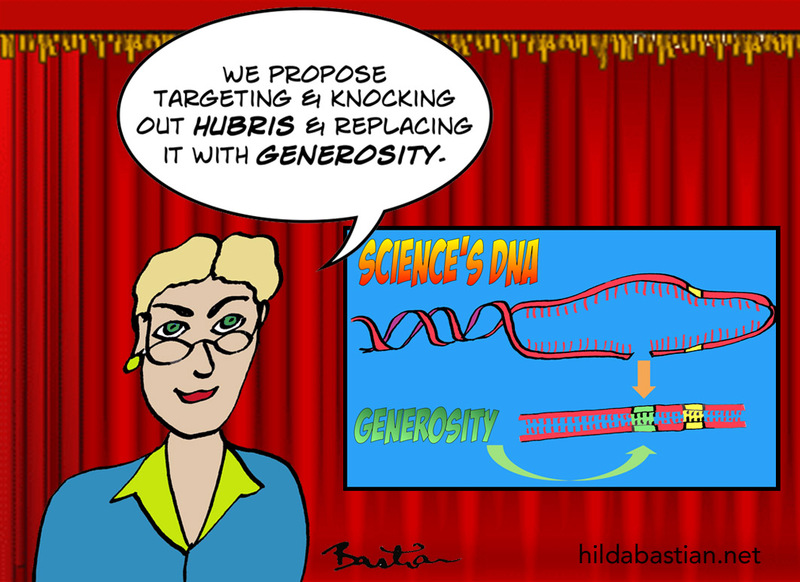 A post from that: If generosity were a scientific norm... Research Nirvana: The Generosity Edition. 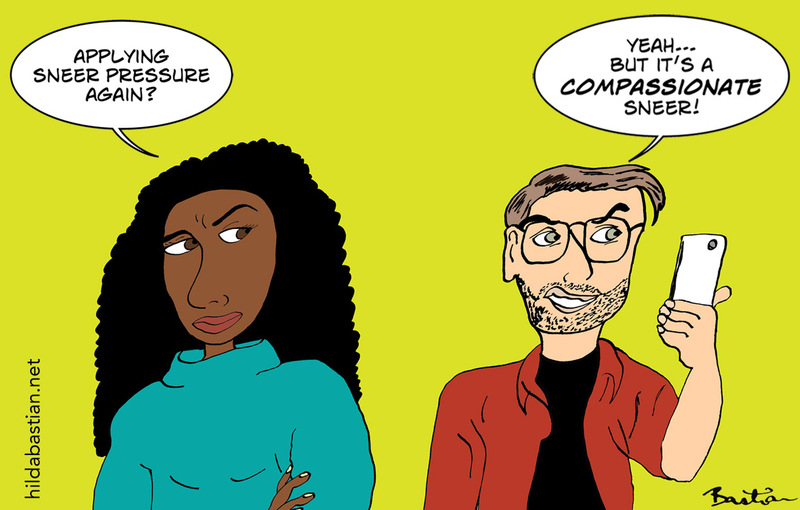 Another installment in my series of posts looking at the evidence and issues around social controversies on social media: Unsnarling the Complexity of Naming and Shaming. And speaking of installments...Would you believe it's been about a year since the Tim Hunt storm? And would you believe it needed another update? So here is an update of an update.... Whatever Happened to #TimHunt? Comment on PubMed Commons: interesting results that might not be what they seem to be, on the important issue of informed consent in IVF clinics (Canadian ones). That is my 50th comment: somehow fitting that it's a throwback to my many years as a maternity consumer advocate! Then I also commented on a new systematic review on peer review and its limitations: my blog post on anonymity and open peer review covers a broader scope, and there was no new study found on these questions in the systematic review. For those attending Evidence Live, I posted links to papers I talked about in the "Best Paper of All Time" session. What was it about May and discussions about conflicts of interest everywhere? I was on that boat too: with an editorial at PLOS Medicine accompanying a new study on financial relationships between industry and organizations that develop clinical practice guidelines. And a post at PLOS Blogs: A Reader's Guide to Conflicts of Interest in Biomedicine. Another old favorite refurbished and added to Tumblr: epidemiological melancholy over the power of the anecdote. 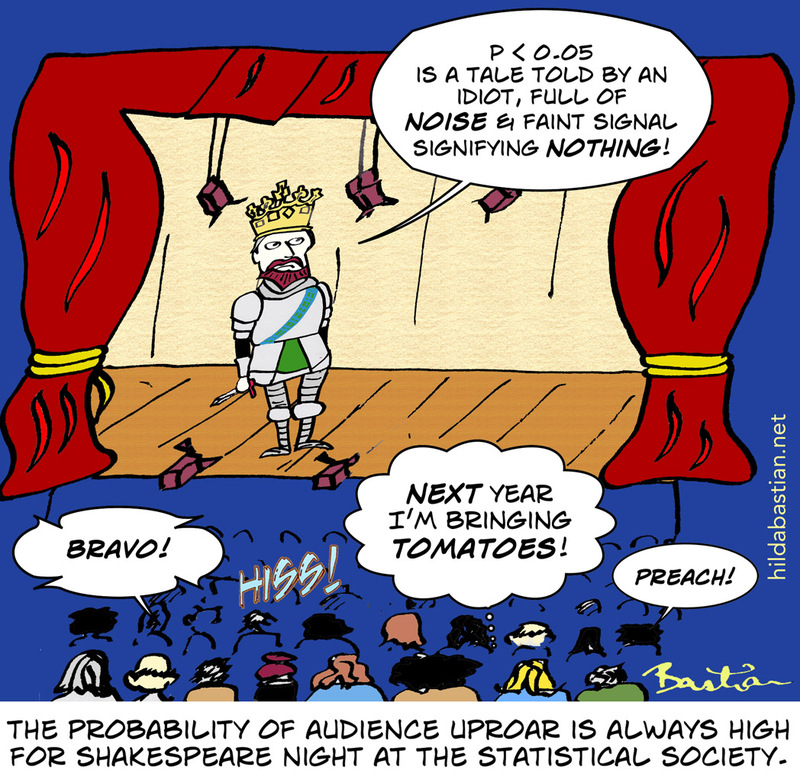 My first post at PLOS Blogs this month: 5 Tips to Avoid P-Value Potholes - a riveting tale of drama and statistical intrigue! My second looked at the hype around ASAPBio: Breaking Down Pros and Cons of Preprints in Biomedicine. The annual national Health Journalism conference in the US was held in a very cold and snowy Cleveland this month. On the 10th, me and Andrew M. Seaman from Reuters Health held a session on some study pitfalls and how to avoid them. I've put my slides online, together with a bunch of my blog posts and some other material in case you want to drill down on any particular issue. You can see it here at Statistically Funny. 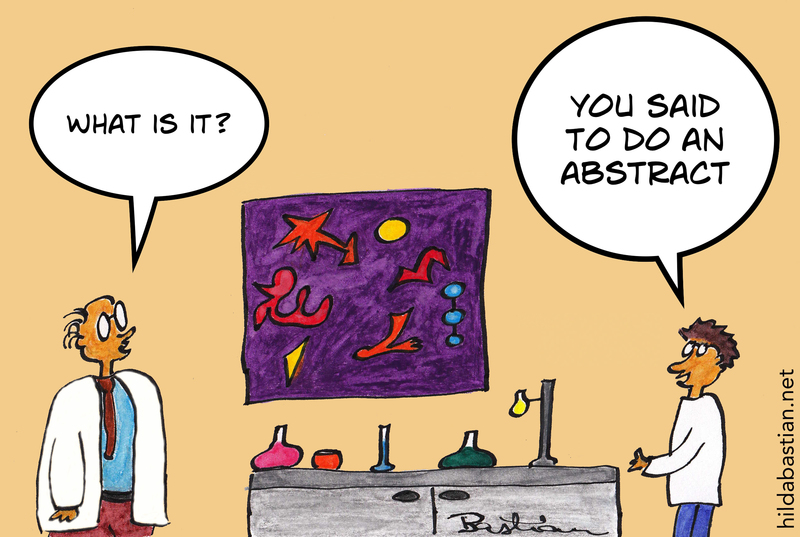 And my first cartoon-based abstract! It's for my talk in the opening plenary for Evidence Live 2016 this June, with Ivan Oransky and John Ioannidis, and Fiona Godlee steering: Research Nirvana - The Listicle! Speaking of understanding studies and data - which are better, natural frequencies or probabilities and percentages? A new study claims a strong answer, but I don't the contents of their paper support that conclusion. I argued why on PubMed Commons. The month started with a profile of me by Molly Weintraub in STAT - along with a sketch portrait by Molly Ferguson. "The idealized expert-generated, one-way, authoritative reign of science is over". That's from a terrific anthropological study. What does it mean for you personally, and why should you care? It's all on us now, guys! 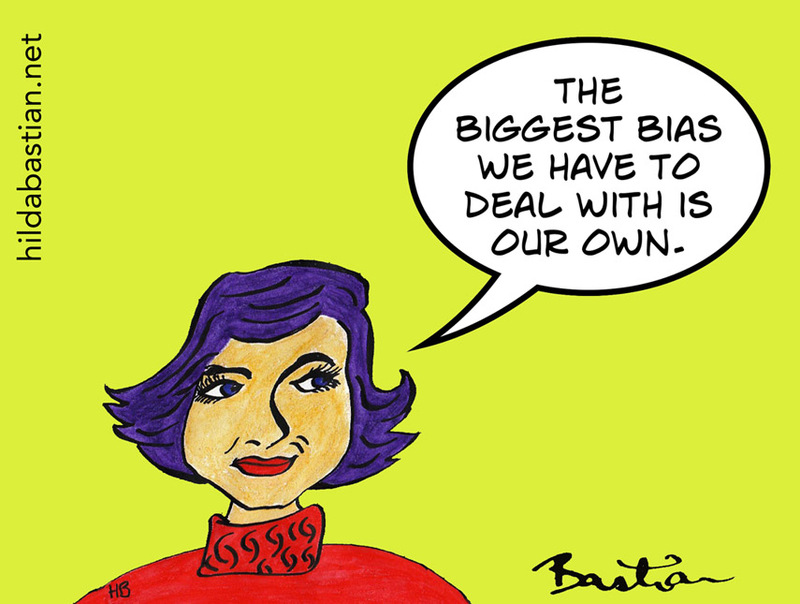 Bias, the Internet, science, and you - my second PLOS post for the month: The Skills We all Need to Move Past "Anti-Science" and "Us". It started with a comment at Statistically Funny, and escalated rapidly! I dug into who developed the statistical methods that are named after Bonferroni, and realized Olive Jean Dunn is credited with developing them. So now, I've added her name to my cartoon, updated my original post as well - and created a Wikipedia page for her for good measure. My visible product for Women's History Month! With a giant thanks to the anonymous commenter - and to Daniël Lakens, who it turned out, was on the same quest at the same time - and who procured the photo of Olive Dunn on Wikipedia. That moment when you can't believe someone reported on a study that bad - then someone you admire tweets it! And another, and another... Leading to my first post for the month over at PLOS Blogs: How to Spot Research Spin: the Case of the Not-So-Simple Abstract. Emily Temple-Wood, a powerhouse behind getting more bios of women scientists in Wikipedia got some great publicity. She also spoke about the harassment she gets. So I decided to speak up about that too. Here's that and the inspiring stuff too. And commenting again at PubMed Commons on a new study of searching for studies for systematic reviews. While on tumblr, re-visiting my take on the "Keep Calm" meme, with Another Day, Another Health Scare! CRISPR, Priority, and Credit: Do We Need to Edit Science's DNA? Talking about the values at the heart of science, and why I think we need to examine this more if we want positive change. And in a week where much has been said about the cons of scientific journals - and many calling for scientists to abandon them completely and wish for their destruction - Lenny Teytelman asked people to say what journals do that's worthwhile. I had a bunch to say! I commented here on Michael Eisen's blog post about preprints and the ASAPBio meeting, too. Wikipedia Activism and Diversity in Science: a post in Absolutely Maybe at PLOS Blogs - and an edit-a-thon at the annual AAAS Meeting in Washington DC. People who faced daunting obstacles left so many inspiring stories. They shouldn’t be invisible. We still need them. It's Black History Month, and I started a Wikipedia page for yet another inspiring, yet little-known, African-American woman scientist: neuroembryologist Mary Logan Reddick - who started college at 15, got a PhD from the female college of Harvard in 1944, became a full professor at the University of Atlanta, and had a fellowship to study for 2 years at Cambridge. And a comment on PubMed Commons related to part of my day job: systematic review databases.